It is proposed the Latrobe City Sports and Entertainment Stadium will become the centre of excellence for football (soccer) in Gippsland – providing a pathway for promising young athletes to elite sport through Gippsland FC and other high performance programs. Works will include upgrades of current grass pitches and construction of a synthetic pitch with lighting. Upgrades to grandstands, change rooms and club rooms are also being considered in line with future potential funding opportunities. The full size synthetic pitch has been installed by Turf One and line marking is being completed. FIFA testing will take place in April with certification expected by the end of July. Lighting to the synthetic pitch is due for installation late March and barrier netting to the south of the pitch will be installed in the coming weeks. In 2017 Council purchased the facility back from its private owners to ensure it is developed and used as a community asset and immediate works were completed to bring the change rooms up to quality and safety standard for major events. Melbourne Victory have since utilized the facility for A-League and W-League pre-season games, while the women’s team has also played a successful in-season match at the venue. Community consultation is continuing with user groups and a Project Manager for major recreation projects has been appointed to oversee the stadium’s redevelopment. A consultant was engaged to develop a master plan and business model, following extensive consultation with the full range of facility stakeholders including Falcons 2000, Gippsland Football Club, Football Federation Victoria (FFV), Latrobe Valley Soccer League, Referees Association and current tenant – Tribes. 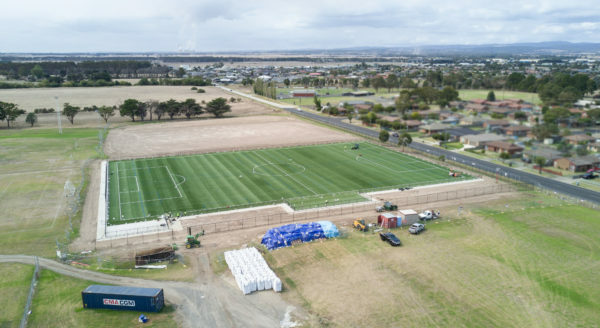 Council has worked with FFV and governing bodies to determine the requirements for centre of excellence status and to refine the parameters for development pathways. A Project Reference Group consisting of a range of local stakeholders is continuing to guide the project.